The Way of the Wandering Star. Christmas is incredible! It would seem easy to prove that it never happened, that it just could never be. Think of it — a man and his wife pause in their pilgrimage before a crowded Inn, find shelter for the night only among the cattle, and there her Baby is born. An angel appears to ordinary shepherds in the fields nearby, announces the birth of that Baby, declares great things about Him; then a host of angels sing an anthem of peace and good-will. The angels disappear and the shepherds go off in search of the Child and find Him even as it was told them. Three kingly travelers appear before an unkingly king, bring strange tidings of a true King to be born under a strange star, then set off down the path of that wandering star to find the Babe even as they believed. They lay their gifts before Him, then mysteriously disappear. And a wondering mother ponders all these strange things in her heart, while a loyal but bewildered husband stands by. Could the birth of that Baby in such strange circumstances be the unfolding of God’s redemptive plan for the human race? It is impossible; yet it happened. It is incredible! Yet it’s true! It’s unbelievable! Yet it is the heart of our highest faith. It just couldn’t happen, yet it did; and because it did history is split in two and the whole destiny of the human race is profoundly altered. It’s too wonderful for words, yet more words have been written, spoken, and sung about it than any other event in history. To the things that cannot be and are . . . ! Think, for example — it cannot be that God has come personally into this world — but He has! Most people give God — some king of Supreme Intelligence and Power — credit for creating the world. It bears the marks of intelligence, order, and design. Back of it, they are willing to concede there is some kind of mind Power and Purpose. It takes a great deal more faith or credulity than most people can muster to believe that it all just happened. For most people there is, back of this world, a mighty Power and Personality. Yet that being so, it seems to some that the world He made has gotten out of control or run off the track. Or perhaps more accurately the people He made to run His world have done a bad job of it — ignoring His purpose and disobeying His Laws, thereby bringing untold misery and heartache and confusion into this world. This world as we see it today is a far cry from the good world God made, from the happy world God intended. What should He do — stand aloof from it, like a watchmaker who has built a beautiful watch, which when it goes wrong, will have nothing more to do with it? Ah, but watchmakers do not act like that. They guarantee their products, and if a watch goes wrong they spare no effort to make it right. Even if it is broken by the carelessness of its owner, they still will make every effort to fix it. God is as good as an honest watchmaker — only more so. He cannot take back His world to make it over, but He can do something infinitely greater and better — something no watchmaker could do, or would if he could. He can go personally into his world and spare no suffering to make it right. And that, says Christmas, is what He does. He does it because He loves these people in this world, for they are not things, like wheels and springs in a watch. They are people, like children of a Father. And He is that Father! Yes, it cannot be that God would come personally into this world, but He has! It is on the fact of the Incarnation that Christianity is built. It stands or falls, lives or dies on that conviction. Furthermore, it cannot be that God entered the world in weakness and poverty. Yet He did! That’s probably why everybody missed Him. They held in their hearts the ancient hope that He would come, but they expected Him to come as a king. He was to be a divinely anointed One, a Messiah, of an ancient line of kings. Kings do not come in poverty. They come in pomp and majesty. If the angels had appeared over Jerusalem instead of over a sheep pasture; if they had blown a thousand trumpets instead of singing a lovely anthem; if the Prince of Heaven had descended in a gleaming chariot of burnished gold, all Jerusalem would have bowed before Him, and possibly even Rome would have quaked and given way to Him. That’s the way we would have done it. That’s the way they dreamed of His doing it. That’s the way some still wish He would do it. That’s what they were looking for, and that’s why they missed Him. For He came the humblest among the humble, the lowliest among the lowly, the weakest among the weak, the most human in the midst of humanity — a Baby born not in a spotless hospital with skilled physicians to attend His Mother, and starched nurses to attend Him. He came amidst the dust and cobwebs and the smells of a cattle cave. For it was to be His highest purpose to go where the lowliest, the dirtiest, the neediest of humanity were. He was to come into the midst of the stench of sin to redeem the world from the sin and save that world from the filth and the stain of it. You see, when God came personally into His world He did not come to the best of it but to the worst of it, to make the best of the worst. He did not come to the highest but to the lowest, to raise them to new heights. To the things that cannot be, and are. Furthermore, it cannot be that God proposes to save the world through love and kindness. Yet He does! Here again we differ with God. We wouldn’t have done it that way. God seems so stupid doesn’t He? The thing to do was to come with pomp and power and all the kingly splendor, as we have outlined, then lay down the law, no longer by prophets and seers, but by celestial soldiers who could have enforced it. No one could have stood before them. Nor could any escape His eye. There would be complete and inescapable inspection of all enemy territory. People would obey — or else! Which of course would have meant that people would have been cowed into submission but not loved into sonship. Their bodies would have been controlled but their heart would not have been won. God could have had control of things — everything, that is, except the hearts of men. He might coerce them but He could never change them, or win them that way. We, of course, still believe that God was wrong. We still believe that the way to deal with this world is to make greater A-bombs, bigger battleships, larger armies, faster planes. Then when we’ve mobilized irresistible might, we can lay down the law, and enforced it. Of course, we’re not quite all-wise, all-just, all-knowing, as God is, but we’re wise enough, just enough, good enough, and know enough to play God. Maybe we can do it — I don’t know. (Confidentially, I have my serious doubts.) Maybe we can do it before we go bankrupt, or crack up from inflation, and our economy goes down in shambles brought on by unrestrained selfishness, unbridled greed, and untempered arrogance. Another steel strike, any other kind of strike won’t matter — just so we get what we want, our union, our company — just so the powerful leaders hold fast their power and pride. Maybe we can do it before we crack up. Maybe we can do it — coerce the world, if first we can coerce enough friends to join our defense plans. We may coerce the world, but we can never win its heart, or gain its love. Suppose we were crazy like God. Suppose we gathered all our resources to give them in love and sacrifice. Suppose we gathered up all our surplus grain and food and loaded it on ships and set them sailing the seven seas to wherever there was hunger and want. Suppose we put no price tag on them, only a gift tag saying, “With love from America in the name of Christ and freedom.” Suppose we denied ourselves a loaf of bread a week, and then loaded our bombing planes with bread, set them roaring over every hungry city in the world, opened the bomb bays to bomb the cities with bread, each loaf labeled, “With love from America in the name of Christ and freedom.” Suppose we did it with medicine and clothes and all the abundance of America. Suppose we didn’t have quite enough, so we rationed ourselves willingly that others might know our love and share it in our abundance, like we ration ourselves to share our bullets and our bombs. Just suppose! You say we can’t afford it? Suppose we diverted a few billions from armaments (millions of which are going down ratholes of waste anyhow) to let loose a few billion for bread. Just suppose! Sounds crazy doesn’t it — crazy like God invading the world as a Babe in a Manger, and dying on a cross to win His victory. Everybody knows it won’t work — everybody but God, that is. Everyone knows the sane and sensible thing to do is to spend our billions on A-bombs and armaments — with four thousand years of history to prove how great are the things military might can accomplish. We’ve done the wise way with military might to lay down the law — and enforce it. Look how it’s worked through the centuries! Yes, just look! The newspapers tell of the Communists sending Christmas stockings across the battle lines to UN soldiers with cheap gifts and propaganda leaflets. We laugh at the crudeness of it — yet, I wonder — are the sons of Satan and Stalin wiser than the sons of God and Freedom? We know their good-will is a lie, their brave new world is a deception, their freedom slavery, their promises hollow. But, do they know our good-will is true (is it? ), our new world better, our freedom really “liberty and justice for all,” and our promises honest? Have they stolen our stuff? — We have reason to give Christmas gifts not as hollow propaganda but as honest expression of our ways of life. Could we have missed the boat? You see, Christmas is incredible! It’s incredible that God should come into the world at all — yet He has! And by that we know how great is his love for it and us. It’s incredible that He should come in weakness and poverty. Yet He did — and thus we see to what depths He will go to save it. It’s incredible that God should propose to save this world through love and kindness — even to the love of a cross. Yet He does — and thus we have a key that can unlock the door to a better tomorrow. 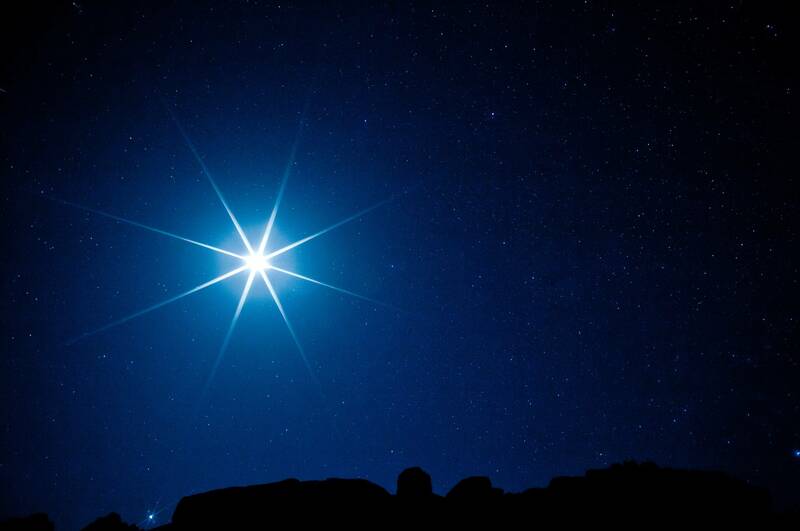 And so this Christmas the wandering star pauses again over a lost and wandering world. It may be this world is nearing the end of the road. It may be we are close to the edge of the precipice over which we will plunge to our doom. Or it may be that a path of light shining from that star will reveal a path of life we’ve never seen before, nor ever dared to travel; and that traveling it we shall walk into the world we’ve longed for but never found. To the things that cannot be and are. Merry Christmas, Lydia and Paul! And thank you for sharing the very sort of nostalgia that makes for a fulfilling Christmas. It makes me wonder at the difference between 1951 and 2015, at how the world has changed--or stayed the same. And there is great marvel that the Birth-story has resounded from pulpits now for nearly two millennia, and that message--for those who have the ear for it--still is preached. And the Star brought the astrologers most of the way, and could bring them no further until they gained final direction from the Word of God spoken by His prophet. Star, and prophecy--God with us! Thank you for posting this, Paul, and Merry Christmas! [I]t seems to some that the world He made has gotten out of control or run off the track. Or perhaps more accurately the people He made to run His world have done a bad job of it — ignoring His purpose and disobeying His Laws, thereby bringing untold misery and heartache and confusion into this world. This world as we see it today is a far cry from the good world God made, from the happy world God intended. What should He do — stand aloof from it, like a watchmaker who has built a beautiful watch, which when it goes wrong, will have nothing more to do with it? Ah, but watchmakers do not act like that. They guarantee their products, and if a watch goes wrong they spare no effort to make it right. Even if it is broken by the carelessness of its owner, they still will make every effort to fix it. God is as good as an honest watchmaker — only more so. He cannot take back His world to make it over, but He can do something infinitely greater and better — something no watchmaker could do, or would if he could. He can go personally into his world and spare no suffering to make it right. A Christmas analogy worthy of the great Paley himself. Merry Christmas Paul. And to all of our W4 contributors and readers / commenters. Thanks for joining our conversations. I like the watchmaker analogy also. So too the refrain evocation of things that are impossible - and yet are. Chesterton would approve, I am sure. John, that's an interesting observation on the magi and their need to consult with the prophets of Israel. I had never before seen a rationale for why they followed a star all that way, consulted with Herod, and then followed a star again to the final destination. It does seem fitting indeed for the Gospel to show them following not solely private revelation but testing that by its conformity with "the law and the prophets". "The following is a sermon preached by my maternal grandfather, Rev. Robert H. Stephens, on December 23rd, 1951." Obviously, the gift of words is strong in your family! A belated Merry Christmas to you and to everyone here at W4. My heart is filled with joy when I consider the things that 'cannot be' and yet are -- not least my faith that "the birth of that Baby in such strange circumstances" is indeed "the unfolding of God’s redemptive plan for the human race!!!" I should give credit for the insight to the commentary on Matthew by Frederick Dale Bruner.